Okay, smidgely lapse of notification—I neglected to mention that Joyce and Jenny and I were going to Walt Disney World on September 26 and returning on October 4. Had a great trip, met up with Allen and Dee, enjoyed Mickey’s Not-So-Scary Halloween Party, and celebrated Epcot’s 25th anniversary. The boys spent the week at home with their tag-teaming grandmothers. 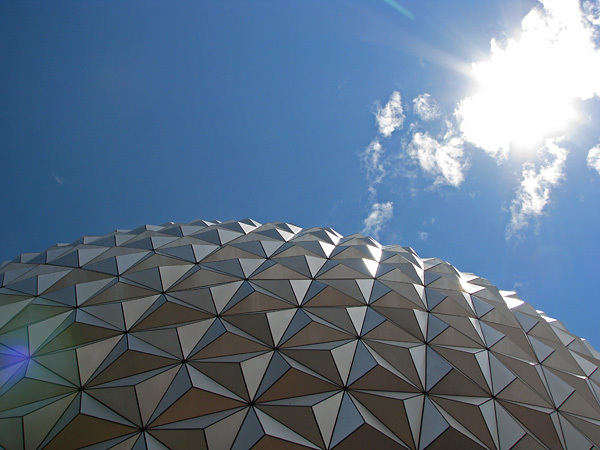 Spaceship Earth, 4 October 2007. Nice Pic. I like the way light plays off the angled parts of the sphere.